Relay the prayers of the vengeful to ensure their vengeance is fulfilled. Go to Bravil once a week and activate the Night Mother's statue to learn the details of somebody requiring the Dark Brotherhood's services. Report these to Arquen in the Dark Brotherhood Sanctuary and receive your reward for the previous week's kill. 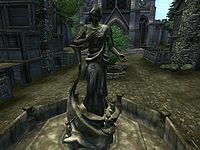 Go to Bravil and activate the statue of the Lucky Old Lady as if you were trying to receive her usual blessing of luck. Instead the Night Mother will tell you that somebody has prayed to her and that you should relay these details to your speaker. You will receive random combinations of one of the following people and locations. None of these locations are in Cyrodiil, so you cannot contact the person in question yourself. A female High Elf named Alwaen. A female Breton named Annabelle. A male High Elf named Aranath. A female Imperial named Avresa. A male Orc named Buramog. A female Imperial named Camilla. A male Khajiit named Dahlima. A male Nord named Erich. A female Breton named Evangeline. A male Imperial named Florentius. A male Imperial named Haderus. A male Dark Elf named Hlanas. A female Wood Elf named Naarifin. A female Argonian named Pasha. A female Redguard named Rhiannon. A male Imperial named Severio. A female Khajiit named Shavari. A female Nord named Sonje. A male Wood Elf named Urunil. The city of Lillandril, on the High Elven home of Sumerset Isle. The city of Blackrose, in the Argonian homeland of Black Marsh. The village of Seyda Neen, on the Dark Elven isle of Vvardenfell. The mead hall known as Thirsk, on the Nord isle of Solstheim. The city of Mournhold, in the Dark Elven homeland of Morrowind. The Ogres Tooth Mountains, on the Redguard isle of Stros M'Kai. The city of Daggerfall, in the Breton homeland of High Rock. The city of Falinesti, in the Wood Elven homeland of Valenwood. The Halls of Collosus, in the Khajiit homeland of Elsweyr. The swamps just north of the city of Archon, in the Argonian homeland of Black Marsh. The city of Sentinel, in the Redguard homeland of Hammerfell. The small, unnamed village just west of the city of Alabaster, in the Khajiit homeland of Elsweyr. The Elden Grove, in the Wood Elven nation of Valenwood. The small island in the Illiac Bay, in the Breton homeland of High Rock. Head to the Cheydinhal sanctuary and speak to Arquen. She will promise you that the matter will be taken care of, and hand over your earnings for the previous week. There is no penalty for not visiting the statue once a week. This quest cannot be finished - it will always stay in the list of active quests. This issue has been addressed by the Unofficial Oblivion Patch; it is removed from the quest list and re-added each time. You can remove the last journal entry by using the following console command: completequest Dark19Whispers. Doing this will not prevent you from delivering the information to your Speaker and receiving your reward. 10 Once a week, I must speak with the statue of the Night Mother in Bravil. The Night Mother will give me a list of names and locations of people who require a visit from a Dark Brotherhood Speaker, to arrange an assassination. If I take this information to Arquen in the Cheydinhal Sanctuary, she will give me my weekly earnings. I can do this every week for as long as I want, and there is no penalty if I choose not to. It is possible to use the console to advance through the quest by entering setstage Dark19Whispers stage, where stage is the number of the stage you wish to complete. It is not possible to un-complete (i.e. go back) quest stages. See SetStage for more information. Esta página foi modificada pela última vez à(s) 20h15min de 17 de outubro de 2014.